Access to the JR has been severely affected by the roadworks on Headley Way, which will continue until summer 2019. Please allow an extra 45-60 minutes' journey time to get to the hospital if you are travelling by car. This does not include the time taken to find a parking space. Please use postcode OX3 9DU, when using online routefinders for directions to the John Radcliffe, to take you to the correct entrance. If driving to the hospital by car, follow signs for Oxford then the 'H' / 'A&E' and 'Hospitals' signs. You'll be directed via the A40 northern by-pass, and B4150 (Marsh Lane) or via Headington on the A420 London Road. These routes take you to the B4495 (Headley Way). The approach road to the John Radcliffe is on Headley Way. From the Woodstock Road, travel north for one mile, then right (Moreton Road) following the 'H' and 'A&E' and 'John Radcliffe' signs, along Marston Ferry Road to Headley Way. There are a few time-limited spaces for dropping off or picking up patients outside the Welcome Centre at the Level 2 main entrance of the John Radcliffe Hospital. There are more patient drop-off areas outside the Emergency Department and in front of the West Wing / Children's Hospital, further down the hill. There are wheelchairs in the reception areas that you can take out to the car to collect a patient if needed. Bays immediately in front of the West Wing / Children's Hospital marked 'Ambulance Parking Only - No Exceptions' are for ambulances only. Please, do not park in this area - this prevents ambulance access and the safe transfer of patients. There is free motorcycle parking on the John Radcliffe Hospital site. For trauma outpatients, cardiac services and main hospital. For main hospital and Women's Centre. For West Wing and Children's Hospital. For parents and carers of children with appointments at the Children's Hospital. It is usually quicker to divert to another car park than to queue for a space to become available in Car Park 3. There is parking for disabled Blue Badge holders in Car Parks 1, 2, 3 and 4: disabled parking within these Pay on Foot car parks is subject to charge. Blue Badge holders must observe the code of the Blue Badge Scheme. 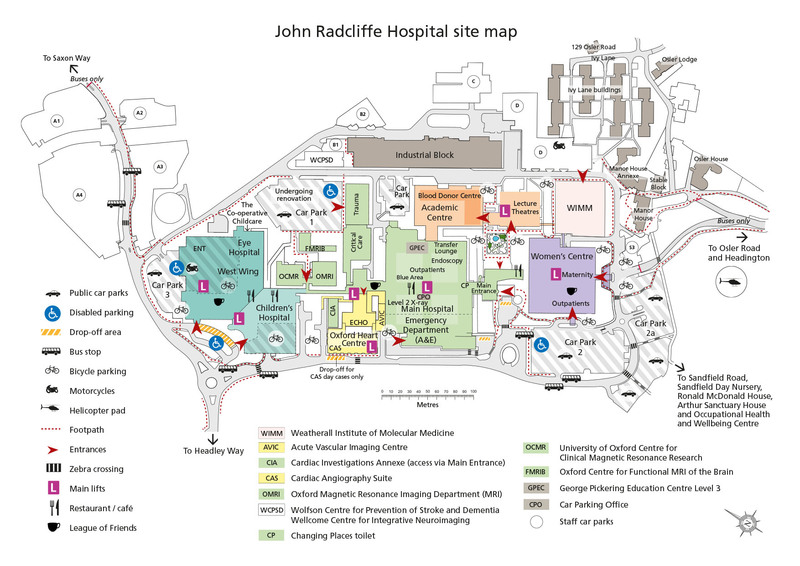 The John Radcliffe Hospital is a private site and therefore Trust parking restrictions apply to all drivers. If you need help outside these times please contact Security via the John Radcliffe Hospital switchboard.